Opera Club de Paris – Mario Lanza » Open your hearts and rejoice ! « The passion for Mario Lanza took me when I was a kid born in Morocco, where I saw The Great Caruso and Serenade. I still see the two grand staircases of the huge theater (Royal Cinema et Théâtre) that an old cousin of mine was managing in the splendid capital city of Rabat. And everywhere in the huge hall, pictures of The Great Caruso starring a handsome young man. Mario Lanza was Opera and Opera was Mario Lanza.I kept that for years and years although I started listening to all the other great voices. 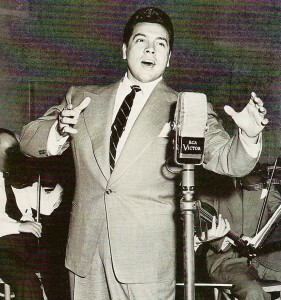 Still, Mario Lanza was special. You could not compare, he was in his own category, no one was with him. Some five years ago, I bought « Arias and Duets » and it was a real shock (Andre Chenier, Otello): emotion and emotion again and always. It was not singing, it was something far beyond, coming from, if I may say, the inner inside. Strangely enough, after listening to that storm, I decided I would take voice lessons: that took me around two years before I could dare face a voice teacher. 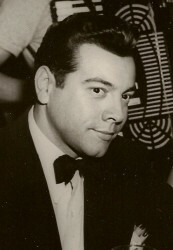 He was a baritone and knew and admired Mario Lanza (now he is an enthusiastic member of the Opera Club de Paris-Mario Lanza). After my first trip to Philadelphia for the Lanza Ball, I felt I had to do something to render justice to the magnificent artist, who was not always recognized as the greatest. When I met Alain Fauquier, who was trying to find someone in France sharing his own passion for Mario Lanza, we decided to create the Opera Club de Paris Mario Lanza and to be the first ones to do it in France, and also to call it Opera Club so that Mario Lanza would be linked to what he definitely belongs to. So what we tell the people is: « Open your ears and your hearts and rejoice ! You will never be the same again, for this is not only singing ! It is something burning, yearning inside of you, and you will never forget it ». Mario Lanza had also the wit, deep charm and charisma of those rare ones who do not pretend, those who bear their truth on their face (« ma verita ») and whose inner beauty lies in the heart. With those blessed happy fews, art is the disguise of heart, and the soul (neshama, in hebrew), through the miracle of the voice, overpours from heaven. This is why the « work » at the « Opera Club de Paris Mario Lanza » is no burden at all. It brings us happiness and love and we hope to give that happiness and love to others. After all, it’s exactly what life is all about. And to think that all this was generated by a young man who died 50 years ago and whose loving soul still blesses our lives year after year! I will never forget the moment in which I first heard the voice of Mario Lanza. I was just 11 at the time, and my father had brought home the LP Mario Lanza sings Hit Songs from The Student Prince and Other Musical Comedies. The immortal Serenade was the first thing he played (“You’ve got to hear this guy, Derek,” he said excitedly). And then it started. Well! To this day, the opening lines of the Serenade send a shiver down my spine whenever I hear this recording. The sheer opulence of the voice, the magical, delicate phrasing, the extraordinary combination of power and poetry: all of these things transported me to a romantic dream world I had never before imagined possible. Mario also led me to discover the grand world of Opera, Neapolitan songs, and American musical theater. In the process, I became enamored of other great singers as well, but it was always Lanza to whom I returned in my teenage moments of loneliness or despair. And I “still” return to him, with the same intense love and appreciation that I first felt 35 years ago. It’s so much more than just a great voice – unique though its luscious coloring undoubtedly is. For as Mario’s contemporary the tenor Oreste Kirkop once observed, “Only a great heart can sing the way that Lanza sang. He was so generous with his singing. I think Lanza, in fact, died a little every time he sang.” Kirkop never spoke a truer word.